Now that you've Marie Kondo-ed all of the books, movies, clothes and toys out of your life, you'll need something to keep you entertained next month — and Netflix has just revealed its list of upcoming titles that are sure to spark joy and keep you on the couch all winter. 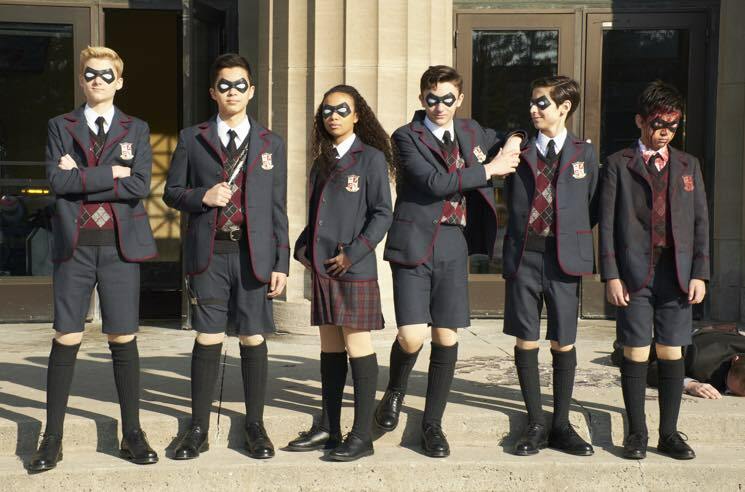 My Chemical Romance frontman Gerard Way's comic series The Umbrella Academy is getting turned into a TV series, and it will premiere on February 15. Telling the story of estranged superhero siblings, the show's cast features Ellen Page, Tom Hopper, Robert Sheehan and Mary J. Blige. There are also plenty of Netflix original films hitting the streaming service next month, including Russian Doll (February 1) starring Orange Is the New Black's Natasha Lyonne, Velvet Buzzsaw (February 1) with Jake Gyllenhaal, El árbol de la sangre (February 8), High Flying Bird (February 8), The Breaker Uppers (February 15), Yucatan (February 15), Firebrand (February 22), Paddleton (February 22), Paris Is Us (February 22) and The Photographer of Mauthausen (February 22). If you need a new TV series to binge, Netflix is releasing Night Flyers (February 1), Siempre bruja (February 1) Bordertown: Season 2 (February 2), ¡Nailed It! México (February 8), The Break: Season 2 (February 9), Flavorful Origins: Chaoshan Cuisine (February 11), Dating Around (February 14), Dirty John (February 14), Chefs Table: Volume 6 (February 22), Rebellion: Season 2 (February 22), Suburra: Season 2 (February 22), The Big Family Cooking Showdown: Season 2 (February 22) and Van Helsing: Season 3 (February 25). For documentary lovers, be sure to check out Mr. Rogers film Won't You Be My Neighbor? (February 1) and ReMastered: The Two Killings of Sam Cooke (February 8). And if comedy is more your thing, you'll want to look into new specials like Ray Romano: Right Here, Around the Corner (February 5), Kevin Hart's Guide to Black History (February 8), Ken Jeong: You Complete Me, Ho (February 14) and Larry Charles' Dangerous World of Comedy (February 15). As always, some titles will be leaving Netflix to make room for the new stuff, so you'll have to watch quickly or say goodbye to 8 Mile, Batman vs. Robin and The King's Speech on February 1; Cloverfield on February 5; Sharknado on February 6; and Ella Enchanted and Scream 4 on February 15. See a trailer for all the upcoming titles below.